Rajasthan Public Health Engineering Department (RPHED) has admit cards/ call letters / hall tickets for written examination reschedule to 15th February 2015 for the posts of Junior Engineer in Civil, Mechanical and Electrical Trade. Earlier Rajasthan PHED had released latest notice PHED- part6 /2014-15/36005 in which RPHED revised written exam schedule for 824 posts of Junior Engineer (Civil, Mechanical & Electrical) Degree/Diploma holders from 25th January 2015 to 15th February 2015 on the various centres at Jaipur. A lot of candidates had applied for these posts. The Latest News is that RAJASTHAN PHED is going to release Admit Cards for these posts available on 30th January 2015 official website of RPHED. Those candidates who had applied for RAJASTHAN PHED JUNIOR ENGINEER Exam 2015 and waiting for admit cards can get their admit cards from the direct link provided in the end of post. · Click on the check point to download Provisional Admit Card for RAJASTHAN PHED JUNIOR ENGINEER Exam. · Download RAJASTHAN PHED JUNIOR ENGINEER Admit Card. 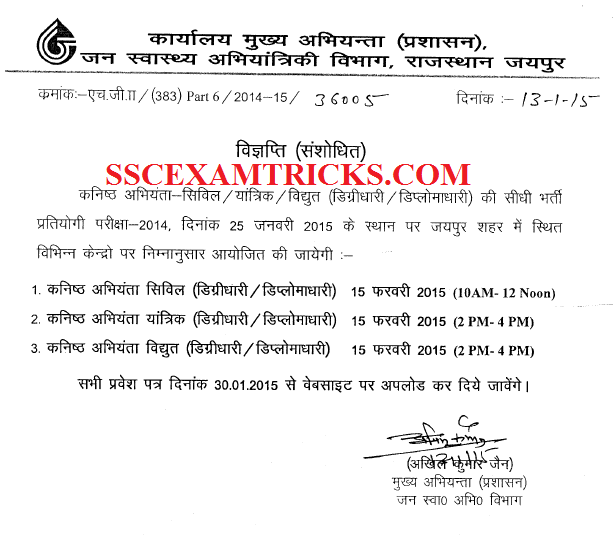 RPHED JE Exam will be conducted on 15th February 2015. The RPHED Exam will be conducted by Pen MODE. There will be OMR sheet needed to be filled by Blue/Black ball point pen. The exam consists of two parts i.e. Part I & Part II. Part I will consist of question of various sections English, Reasoning, Quantitative Aptitude, General Awareness and Technical & Professional Knowledge. Part I will cover 40% of total Exam questions. Part II consists of Technical Questions depends up on the stream of candidate. Part II will cover 60% of the total exam questions. The exam was a multiple choice question paper of 100 questions of 200 marks and four options were provided out of which candidates need to choose one correct answer. The time duration was of 2 hours or 120 minutes. There will be negative marking of 1/3rd to each wrong answer provided.